This day-by-day diary of The Preachers' live, studio, broadcasting and private activities is the result of two decades of research and interview work by Bruno Ceriotti, but without the significant contributions by other kindred spirits this diary would not have been possible. So, I would like to thank all the people who, in one form or another, contributed to this timeline: Keith Temple, Felix Aeppli, Nick Warburton, Bill Wyman, Roger Bristow, John H. Warburg, Peter Millington, and Alan Clayson. 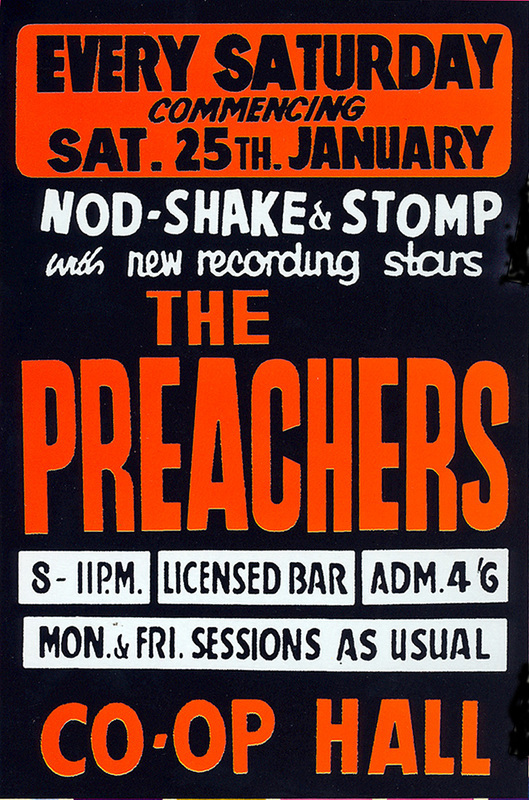 Mostly known for the presence of Peter Frampton in their lineup, The Preachers were one of the seminal bands of the mid-60's British beat and rhythm 'n' blues scene. The band was led by Anthony 'Tony' Chapman, a drummer from Sydenham, South London, who started his musical career in the early 60s, playing first with The Cliftons and then with The Rolling Stones (both with his longtime friend Bill Wyman on bass). 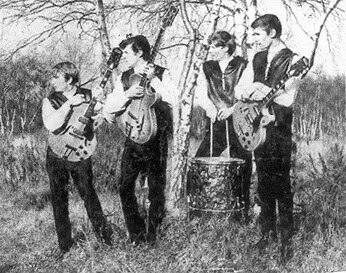 After he was fired from the latter band in January 1963 (in favour of Charlie Watts), Tony joined a well-known Croydon-based band called The Strangers. 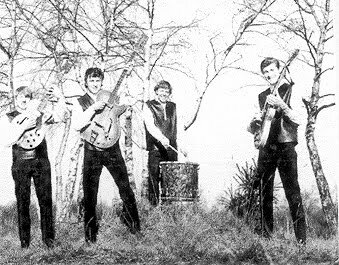 Shortly after, however, the band folded for some reason, so Tony and the band's bass player Keith Temple (b. Gerard Keith Temple, 1944, Alford, Lincolnshire) decided to form a new band together. Tony told Keith he had a friend, Steve Carroll (b. 1944/45), who had played lead guitar and sang in The Cliftons with him, so they got him along for a trial. Steve was an amazing guitarist, a Chuck Berry admirer, and a superior player to Keith Richards at playing Chuck Berry stuff. He also sang the Chuck Berry numbers. 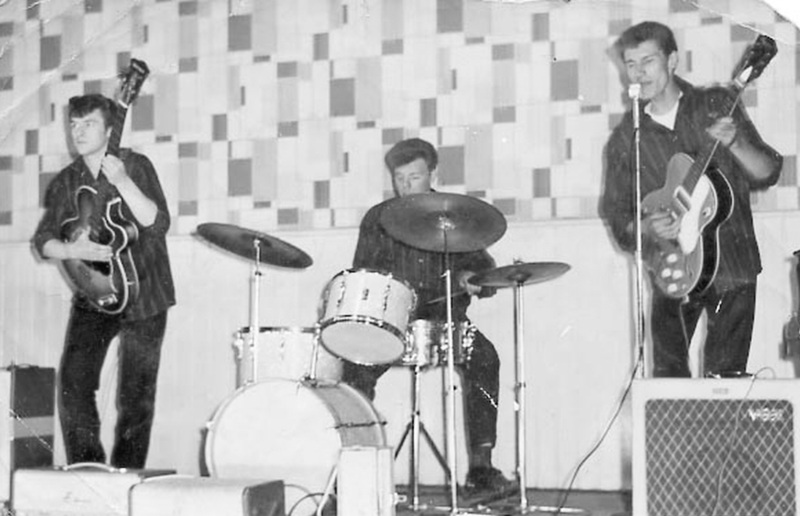 So he joined Tony and Keith and they started out as a trio called The Alphabeats. "One of the first gigs we got was on a 'Riverboat Cruise' - a sailing boat sailing down the Thames from Charing Cross to Hampton Court and back," Keith Temple recollects. "This boat had a bar room downstairs, and on the upper deck outside we were playing while people danced. It was quite exciting because The Rank Organisation were filming on the boat that day to make a short film called 'Jazz All The Way' which was part of their 'Look at Life' series which they used to show before the main feature film at Odeon Cinemas all over the country. When we got to see the film, they showed the boat going along the river but it had jazz music dubbed in and the only shot of the band was of Tony drumming. This must have been around May 1963 as near as I can guess. The weather was quite nice on the day it was filmed and we were only wearing shirts. I have a photo of that gig too." 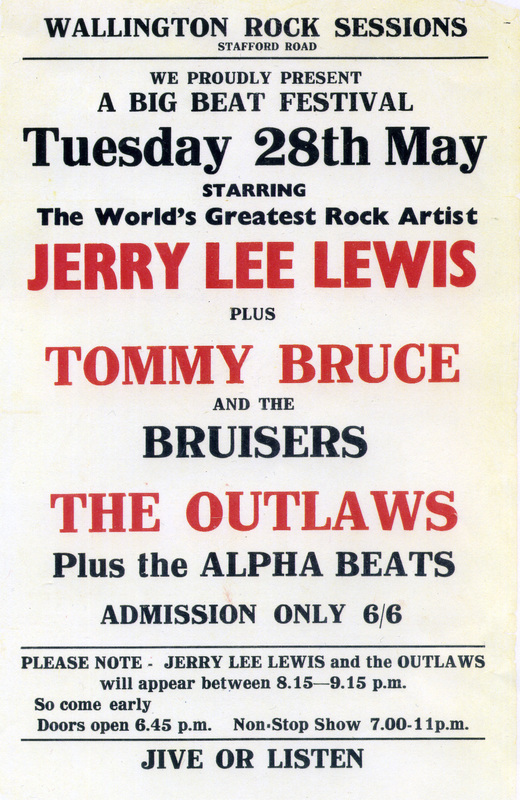 The Alphabeats were on the bill (misspelled as 'The Alpha Beats') along with Jerry Lee Lewis, The Outlaws, Tommy Bruce and The Bruisers. "One of our first gigs was supporting Jerry Lee Lewis at a local dance," Keith Temple recollects. "He was touring England. We shared a dressing room with him (he was there with his wife) and I got his autograph". "Wallington Public Hall had an upright piano permanently on the stage and Jerry Lee asked us if he could use one of our guitar amplifiers to amplify his piano," Keith adds. "We lent him Steve Carroll's old Vox amplifier. He looked at it and said 'Gee that's rather an ancient looking amplifier!'". "We probably did 7:00-7:45pm," Keith also recollects about the show, "then The Outlaws probably did 15 minutes or so on their own before Jerry Lee Lewis appeared onstage. The Outlaws backed him from 8:15 to 9:15pm. Tommy Bruce and The Bruisers would probably do an hour from 9:15 to 10:15pm, and we probably finished off the evening until 11pm." Also on the bill: Brian Poole and The Tremeloes. Also on the bill: The Hollies. Also on the bill: Wayne Gibson and The Dynamic Sounds. The Alphabeats played at a wedding reception. The Alphabeats decided they needed another singer. "We never had a separate singer and Steve was finding it hard work doing most of the singing and lead guitar work," Keith Temple confirms. Originally Keith suggested a 17-year-old kid named Andy Bown, a fan of the band who used to take photos and occasionally came on gigs with them. "Andy came to see us at local gigs and we became friendly, and went back to his parents' house in Beckenham with him afterwards sometimes," Keith recalls. "He played the piano quite well. He worked in London for The Daily Mirror, Britain's biggest national newspaper, and he was the assistant to Franklin who was their political cartoonist. Andy had a camera (which was a bit of a luxury in those days) and came in our van with us on one or two gigs but he never played piano with us. When Steve said he'd like an extra person in the band to do some singing to ease the burden on himself, I wanted Andy to join the band as he was good-looking and a competent pianist, however for some reason that didn't happen." So, at that point, the band auditioned for another singer/guitarist and they ended up with a guy named Terence 'Terry' Clark. "We put an advert in either Melody Maker or New Musical Express and he was the best of the bunch," Keith confirms. "I don't know his backround regarding what bands he'd played in previously, but he was quite a good singer." "Terry was a good strummer and had a distinctive voice for rock 'n' roll and ballads too," Keith adds. "He used to sing the slow ballad 'Seven Golden Daffodils' which Lonnie Donegan made popular and that always went down well at dances. But then he also sang Jerry Lee Lewis' rock number 'Great Balls of Fire' well so he was useful." Also on the bill: Mel Turner and The Mohicans. 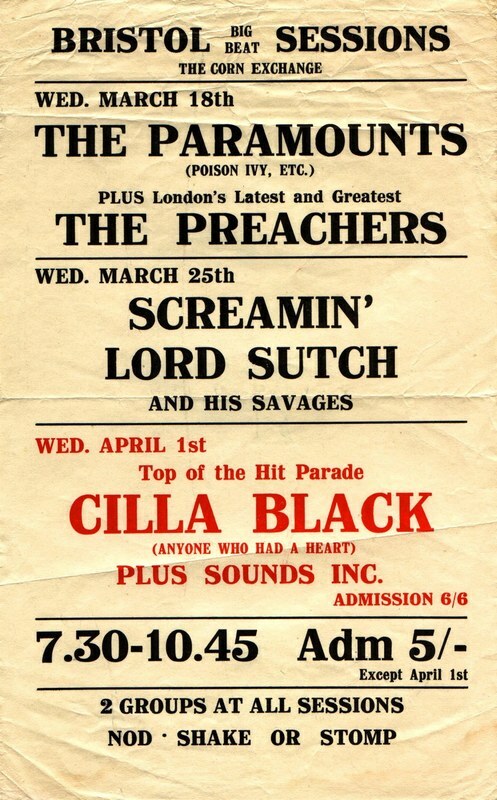 Also on the bill: Screaming Lord Sutch and The Savages. Also on the bill: The Federals. "We had just set up our gear in the officer's mess (probably about 7.30 pm)," Keith Temple recalls, "and were just running through a couple of numbers before people arrived when we were told to stop playing. Everyone there was standing round looking at the television in the corner of the room. It was just after President Kennedy had been shot and they were watching the news. We were told to pack up and go home - but we still got paid." Also on the bill: Big Dee Irwin. The Alphabeats changed their name to The Preachers. Although Keith Temple was not sure who came up with the new name, apparently it was suggested, at least according to him, by their recently hired manager Freddy Bannister, a local dance promoter who ran dances every week all over the country and later went on to stage the big pop festivals at Knebworth. In 2003 he also wrote a book called There Must Be A Better Way relating his experiences as a music promoter and which contains a chapter on The Preachers. "Let me tell you about Freddy Bannister," Keith Temple recalls. "Because he ran lots of weekly dances around the country, two of them quite near to us (Redhill Market Hall & Wallington Public Hall) we knew him from our time with The Strangers, as The Strangers regularly played supporting group at those two venues. Therefore when The Strangers disbanded and The Alphabeats were formed (just a trio then) we approached him for gigs which he gave us, and we used to do little jobs for him like fly posting posters on buildings for him. Perhaps he saw some potential in us or didn't want to miss out on the 'beat boom' because he decided to sign us up and become our manager". The deal between Freddy and the band was signed after a meeting held at The George Pub in Hayes, near Freddy's home. "Once Freddy was our manager we got more regular work from him," Keith adds. "He promoted dances in Wallington, Redhill, Stourbridge, Kidderminster, Bath, Bristol, and others. The format of these dances was always the same. The support group would go on for the first 45 minutes or so, then the 'famous' group would go on afterwards and then we would finish up doing the rest of the evening. Freddy was clever because he'd book a band at a good price when they had a record first released and hopefully it would be in the charts by the time they appeared at his dance hall, which meant he'd got a Top 10 act at a bargain price." Anyway, thanks to Freddy, the band had enough work and enough money to live on the earnings, to give up their regular day jobs at that point (all except Terry). "When The Alphabeats were formed, for several months afterwards we all had day jobs," Keith confirms. "Tony worked in an office in Croydon. I was working at a Croydon company wiring up small electrical equipment. This mean I had to get in to work at 8:00am even though I might not have got to bed until 2:00am that morning. I was sometimes so tired I fell asleep at my workbench or I would go to the toilet to have a short sleep. Terry worked for a shop delivering washing machines etc. He was supplied with a company van and often used to drive himself to gigs whereas Tony, Steve and myself would travel in the group's van. I'm not sure if Steve was working." The Preachers also used to practiced there at the time. "To be honest I can't remember it at all - it was a long time ago! ", Keith Temple recalls about the venue. "It was probably what was called a 'Youth Club' in those days. They had a few dances, sold soft drinks, maybe had a jukebox - that sort of thing. They were nice places for teenagers to go to and meet and chat up the girls etc. Nowadays they do it on a computer!". 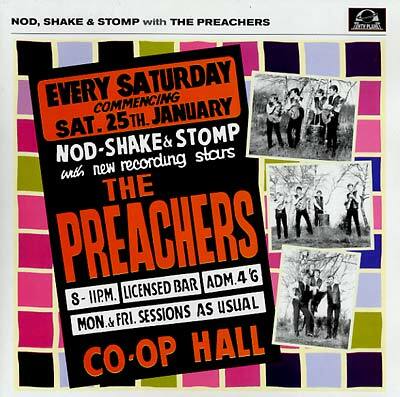 ​The Preachers booked some time at the IBC Recording Studios where they recorded two songs titled 'Sweet Little Rock 'n' Roller' and 'Don't You Lie To Me' for a demo disc, and these ended up on the band's posthumous live album, 'Nod, Shake & Stomp With The Preachers" (Tenth Planet TP053). The album was released on Friday, August 30, 2002, on a limited edition of 1000 numbered copies, and included an insert featured lenghty liner notes from Bill Wyman, that document his journey from pre-Preachers outfit The Cliftons to the Stones, with the aid of some great, previously unpublished photos and gig posters from Bill's personal collection of memorabilia. In the meantime, that same day, Keith Temple gave up his daytime job as electronic wireman at 'Philips Electrical' in Croydon, to go "professional" with The Preachers. The Preachers took their friend Andy Bown along with them and he took a few photos. Also on the bill: Wayne Fontana and The Mindbenders. Also on the bill: The Redcaps. 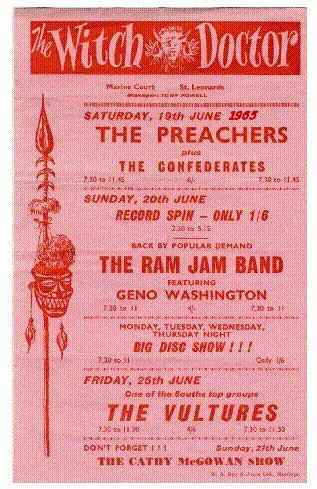 Also on the bill: Gene Vincent. Andy Bown came with the band. Also on the bill: The Big Three. Also on the bill: Jeff Curtis And The Flames, and Pat McQueen Combo. Also on the bill: Freddie and The Dreamers. The Preachers played at a wedding reception. Also on the bill: The Checkmates. Also on the bill: The Paramounts. The Preachers played at Tony Chapman's old school. Also on the bill: The Cossacks, plus two other unknown bands. 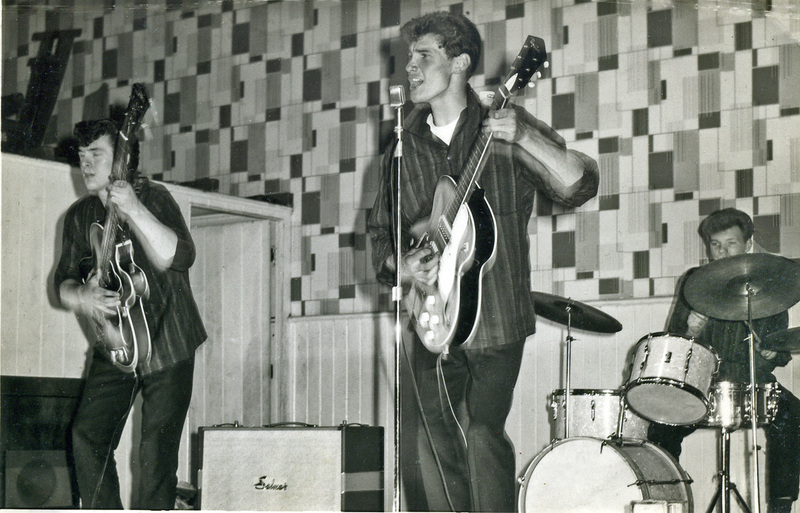 "The guy who ran a dance at Beckenham Public Hall, John (don't know his second name), recorded us on an ordinary tape recorder at the side of the stage," Keith Temple recalls. "There was no proper sound balancing or anything and the quality of the sound varied so that sometimes the vocals were muffled. Then I borrowed the tape from him and I had the best ones transferred to acetate discs at the time which got scratchy over the years as they're not intended for heavy use. Later in 2000 I copied the acetate discs onto a tape and sent it to Bill Wyman, so he would have a memory of his old late friend Steve Carroll's guitar playing." At that point Bill wrote back to Keith that he would like to released the recordings on a limited edition 190gm vinyl LP, which he did in conjunction with a small independent label called Tenth Planet Records. The album was, nedless to say, the above mentioned, 'Nod, Shake & Stomp With The Preachers'. Aside for two or three songs which weren't on the album (including a cover of Bo Diddley's 'Cops And Robbers' sang by Tony Chapman), all the other fourteen songs the band played that day appeared on the album: Ray Charles' 'Talkin' Bout You', The Shirelles' 'Boys', Chuck Berry's 'Johnny B. Goode', 'Reelin' And Rockin', 'Blue Feeling' 'I've Gotta Find My Baby', 'Route 66' and 'Back In The USA', Fats Domino's 'Blueberry Hill' and 'Don't Lie To Me', Jerry Lee Lewis' 'Great Balls Of Fire', Johnny Kidd & The Pirates' 'I'll Never Get Over You', Little Richard's 'Lucille', and Jimmy Reed's 'Honey What's Wrong'. The Preachers auditioned for famous producer Tony Hatch, but it didn't go well and they were rejected! Also on the bill: Tony Rivers and The Castaways. 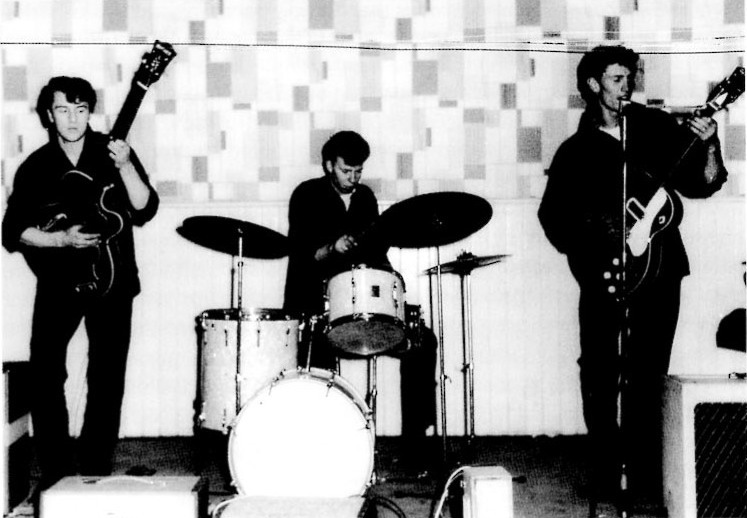 Also on the bill: The Merseybeats. The Preachers recorded another two songs titled 'Goodbye Girl' and 'You've Got To Take It' for a demo disc which nobody liked and that remained unissued. Keith Temple himself never got a copy of that. Also on the bill: The Cossacks, Tommy and The Crestas, The Con-Men. 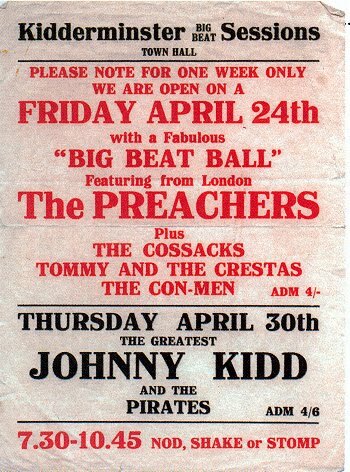 Also on the bill: Johnny Kidd and The Pirates. Also on the bill: The Four Pennies. Keith Temple's last gig with The Preachers. Keith Temple was getting a bit fed up with travelling round the country in a van so he told the band he was leaving (and since then he disappeared from the music scene). Their old friend Andy Bown (b. Andrew Steven Brown, Wednesday, March 27, 1946, City of London) took the opportunity to take Keith's place on bass, although he'd never played that instrument before! 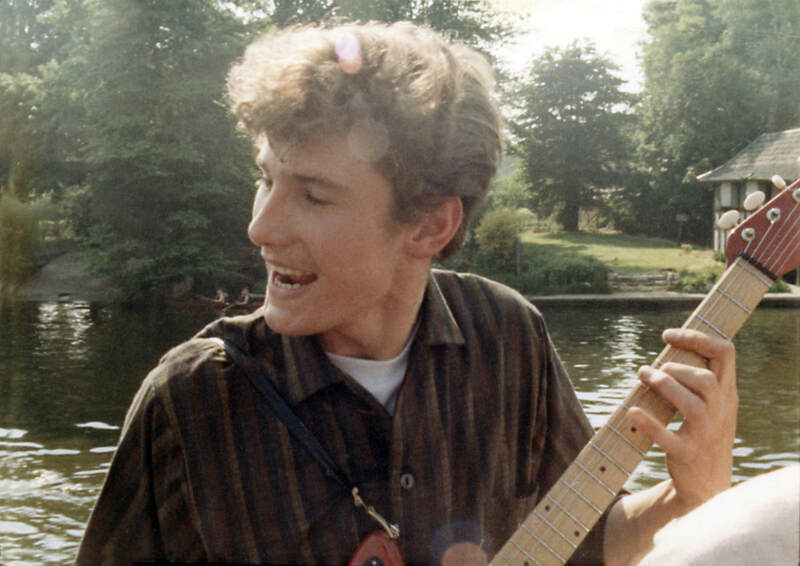 The show was cancelled because on the way to Stourbridge, The Preachers' van crashed into a telegraph pole and sadly Steve Carroll was killed, while Tony Chapman had sustained head injuries and, because of that, he apparently had no memory of the last two hours before the accident. "It would appear that the van hit a telegraph pole and Tony was thrown out," Keith Temple recalls. "The van carried on moving which carried it over a bridge. Steve was trapped against the steering wheel, and as Tony had started giving him driving lessons around this time, there seems some possibility that maybe Steve was driving at the time." Luckily, Terry Clark and Andy Bown were not in the van with them. "Terry and Andy both had day jobs so were driving to the dance together later in Terry's van," Keith confirms. "Terry could use the van for his personal use so he and Andy probably arranged to travel after work that day." Anyway, shortly after, Tony, Terry and Andy, with Freddy Bannister still as manager, hired a couple of new musicians and put together a new band called The Herd but...that's another story. Tony Chapman was eased out from The Herd and he subsequently re-formed The Preachers with Peter Gosling, aka 'Moon', on vocals and organ, formerly of the Denny Mitchell Soundsations, Pete Attwood, aka 'Face', on bass, Ken Leamon on sax, and Peter Frampton on guitar (b. Peter Kenneth Frampton, Saturday, April 22, 1950, Beckenham Maternity Hospital, Beckehnam, London Borough of Bromley, Greater London), formerly of The Little Ravens, and The Trubeats. Also on the bill: The Confederates. One show, from 7:30pm to 11:45pm. The Peachers recorded their debut single, 'Hole In My Soul / Too Old In The Head', with Bill Wyman of The Rolling Stones as producer. 'Holy In My Soul' was a Sascha Burland's cover, while 'Too Old In The Head' was an original written by Tony Chapman. 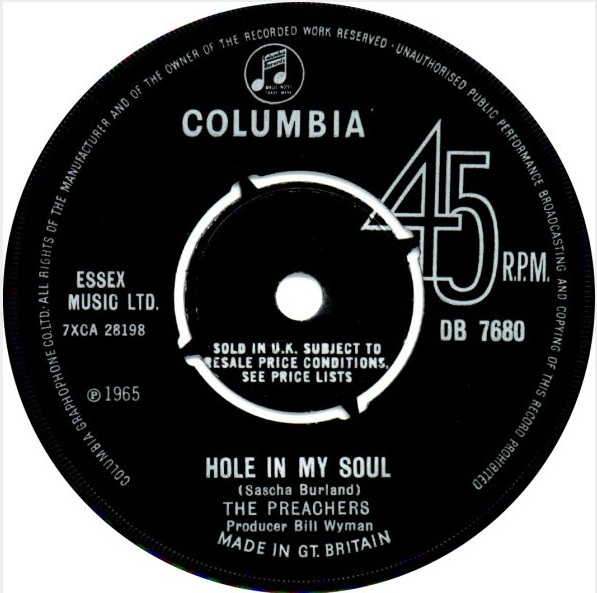 The Preachers' first and only single, 'Hole In My Soul / Too Old In The Head' (Columbia DB 7680), was released only in the UK. The Preachers appeared once on this pioneering British rock and pop music television programme which used to air live every Friday evening (6:08-7:00pm) and which was hosted by Cathy McGowan. This episode was actually a special one "event" centered on The Rolling Stones, which was taped today and then broadcasted a week later, on Friday, September 10. The Preachers appeared as opening act after an introduction speech made by their producer and Stones' bassist Bill Wyman. The Preachers recorded four songs - 'Gotta Go Catch Me A Woman' written by Bill Wyman and Peter Gosling, 'It’s In My Mind' written by Tony Chapman and Peter Gosling, 'Marriage Is For Old Folks' written by Carr-Shuman, and 'Say What I Mean' written by Tony Chapman and Peter Gosling. Bill Wyman produced the session, while Glyn Johns was the sound engineer. 'It's In My Mind' was released a couple of years later on a single credited to Moon's Train (the band Gosling, Attwood and Leamon formed after The Preachers split up). All the fours songs were also released only in Germany in December 1996 in the Moon's Train's anthology CD, 'The Life I Lead - Rare Recordings 1965-1967' (In-Akustik INAK 11004 CD). The Preachers, again with Bill Wyman as producer and Glyn Johns as sound engineer, recorded several songs included one titled 'Deed I Do', written by Walter Hirsh and Fred Rose, that was released a year later on a single credited to Moon's Train (the band Gosling, Atwood and Leamon formed after The Preachers slipt up). The Preachers split up. Peter Frampton went to play with The Herd, Peter Gosling, Pete Attwood and Ken Leamon went to form a new band called Moon's Train, while Tony Chapman disappeared from the music scene. Moon’s Train's first and only single, 'Deed I Do / It’s In My Mind' (MGM K 13654), was released in the US (and later on Friday, March 10, 1967, also in the UK). As mentioned above both songs were actually recorded by The Preachers.